We call these influencing factors the drivers of health. While the percentages may vary from study to study, research shows that some drivers have more influence on health than others. (4) Another term for the drivers of health is the social determinants of health. 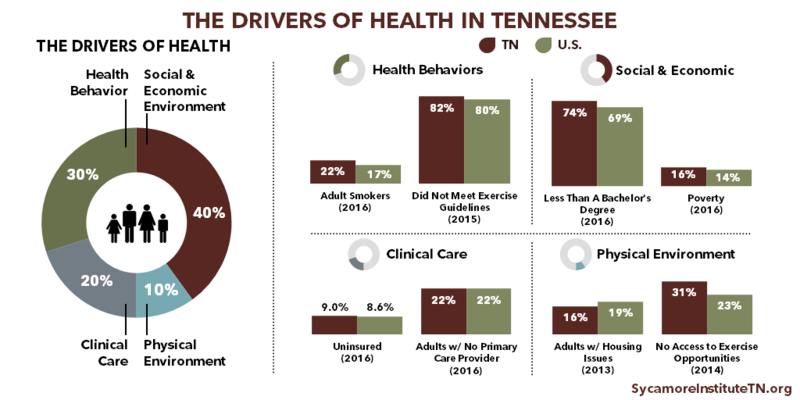 To see how your area of Tennessee fares on the drivers of health, check out our county health profiles. The social and economic environment includes things like education, jobs, income, and social support. Our social and economic environments affect whether we have access to a quality education, job opportunities, safe neighborhoods, social support, and healthy foods. All of these factors influence health. In fact, a person’s education and income are the greatest predictors of their health. (5) Individuals with higher levels of education and income tend to live longer, healthier lives. (6) (7) This relationship exists at both the individual and community level. (8) People who live in wealthy, highly-educated communities are more likely to be in better health and live longer than those who do not. Our health behaviors are the choices we make that affect the length and quality of our lives. Some of the most significant health behaviors are smoking, physical activity, and diet. (4) All 3 affect a person’s risk for developing diabetes, cardiovascular disease, cancer, obesity, and other chronic illnesses. (9) Behavioral change in these 3 areas can seriously affect our health outcomes and quality of life. While health behaviors are a personal choice, our environments can encourage or discourage certain behaviors. The physical environment encompasses the natural and built environments — including transportation systems, buildings, and public resources. (11) People’s school, work, and home environments have a direct effect on their health and also influence their health behaviors. (12) For example, access to sidewalks, parks and playgrounds offer opportunities for physical activity, while exposure to pollution or unsafe drinking water contributes to health conditions like asthma and waterborne illness. 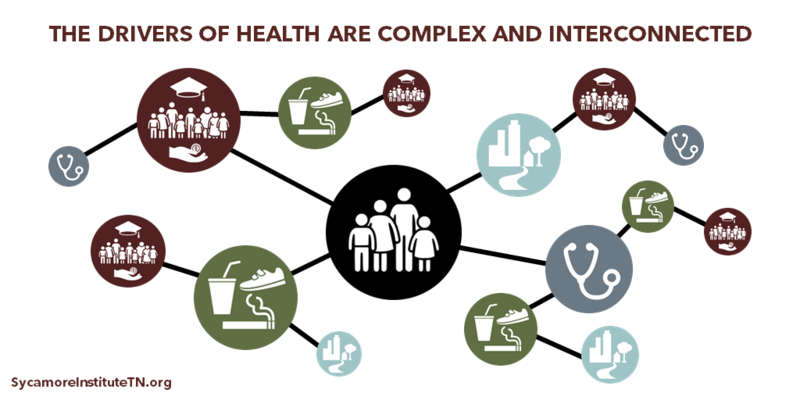 The drivers of health are complex and interconnected. Each one can influence the other drivers in addition to our overall health. For example, a person’s economic means and environment can encourage or discourage healthy behaviors. The drivers’ effects on health can also accumulate over time. (February 21, 2017) Summarizes existing research on how transportation systems can affect health and well-being, both directly and indirectly. (April 20, 2017) Discusses what the research says about the connection between affordable, quality housing and health and provides relevant housing data for Tennessee. (May 4, 2017) An introductory discussion of how different areas of public policy can impact the drivers of health and ultimately health outcomes. (May 16, 2017) Explores the links between the two conditions and what they mean for health and well-being in our state. (July 5, 2017) Looks at the science of adverse childhood experiences (ACEs), their health and economic impact, the prevalence of ACEs in Tennessee, and what our state is doing about it. (December 21, 2017) Explains the mutually influential relationship between health and education. (June 6, 2018) Explores the complicated relationship between income, wealth, education, social standing, and health outcomes. Obviously, genetics also play a role in the health of individuals and the populations to which they belong. (3) (4) (5) Some of us have genes that make us more susceptible to certain diseases. Other genes may affect our propensity for physical activity, and so forth. What separates genetics from the 4 drivers of health discussed above, however, is the direct influence of public policy and the availability of data. “Public policy” refers to the system of laws, regulatory measures, courses of action (or inaction), and funding priorities implemented by a government entity or its representatives. These levers of public policy have tremendous influence on our social and economic environments, our health behaviors, our clinical care, and our physical environments. Technological breakthroughs and a deeper understanding of “epigenetics” (i.e. how genetics are impacted by environments and experiences) are bringing the subject of genetics closer to the realm of public policy. However, data on genetics are not routinely collected or publicly available. U.S. Centers for Disease Control and Prevention (CDC). 2016 Behavioral Risk Factor Surveillance System. [Online] 2017. Accessed via https://www.cdc.gov/brfss/brfssprevalence/. —. Underlying Cause of Death 1999-2016. WONDER Online Database. [Online] December 2017. Accessed via http://wonder.cdc.gov/ucd-icd10.html. U.S. Department of Health and Human Services (HHS). Recommendations for the Framework and Format of Healthy People 2020. The Secretary’s Advisory Committee on National Health Promotion and Disease Prevention Objectives for 2020. . [Online] October 28, 2008. https://www.healthypeople.gov/sites/default/files/PhaseI_0.pdf. McGovern, Laura, Miller, George and Hughes-Cromwick, Paul. 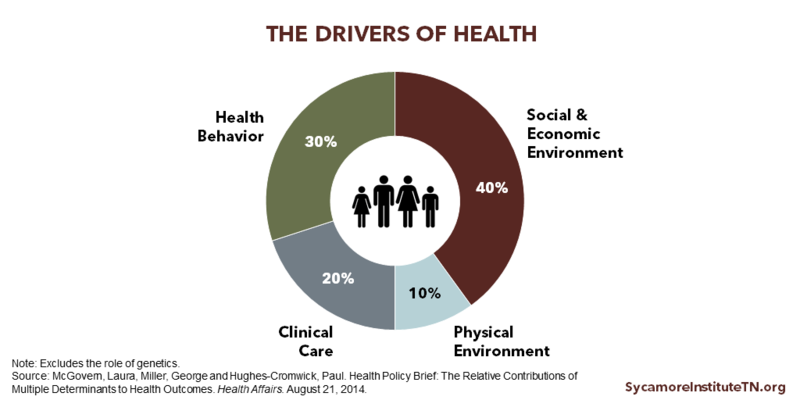 Health Policy Brief: The Relative Contributions of Multiple Determinants to Health Outcomes. Health Affairs. [Online] August 21, 2014. https://www.healthaffairs.org/do/10.1377/hpb20140821.404487/full/. Woolf, Steven H., et al. The Health of the States: Summary Report. Center on Society and Health at Virginia Commonwealth University and Urban Institute. [Online] October 2016. https://www.urban.org/research/publication/health-states/view/full_report. Goldman, Dana and Smith, James P. The Increasing Value of Education to Health. Social Science & Medicine. [Online] May 2011. https://www.ncbi.nlm.nih.gov/pmc/articles/PMC3119491/pdf/nihms295273.pdf. Woolf, Steven H., et al. How are Income and Wealth Linked to Health and Longevity. Center on Society and Health at Virginia Commonwealth University and Urban Institute. [Online] April 2015. https://www.urban.org/sites/default/files/publication/49116/2000178-How-are-Income-and-Wealth-Linked-to-Health-and-Longevity.pdf. Galea, Sandro, et al. Estimated Deaths Attributable to Social Factors in the United States. American Journal of Public Health. [Online] August 2011. https://www.ncbi.nlm.nih.gov/pmc/articles/PMC3134519/. Mozaffarian, Dariush, et al. Population Approaches to Improve Diet, Physical Activity and Smoking Habits: A Scientific Statement from the American Heart Association. American Heart Association. [Online] September 18, 2012. https://www.ncbi.nlm.nih.gov/pmc/articles/PMC3881293/. Gulliford, Martin, et al. What Does ‘Access to Health Care’ Mean? Journal of Health Services Research & Policy. [Online] July 1, 2012. http://journals.sagepub.com/doi/pdf/10.1258/135581902760082517. Northridge, Mary E., Sclar, Elliot D. and Biswas, Padmini. 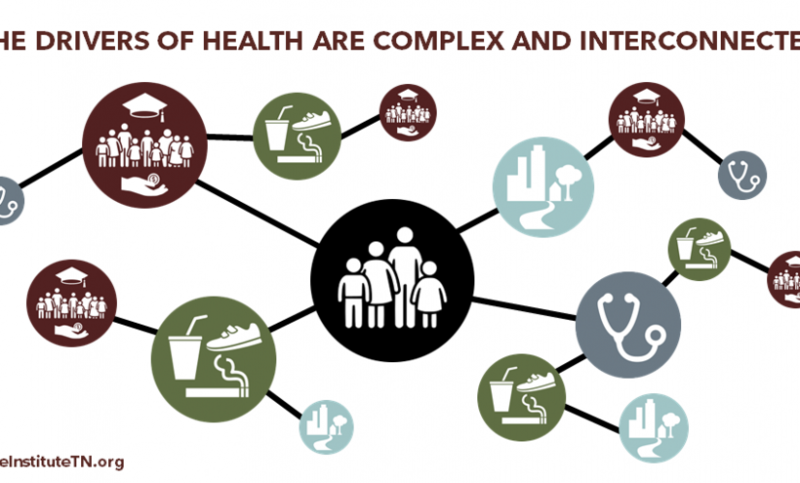 Sorting Out the Connections Between the Built Environment and Health: A Conceptual Framework for Navigating Pathways and Planning Healthy Cities. Journal of Urban Health. [Online] December 2003. https://www.ncbi.nlm.nih.gov/pmc/articles/PMC3456215/. The Robert Wood Johnson Foundation. Overcoming Obstacles to Health. [Online] February 2008. https://www.rwjf.org/content/dam/farm/reports/reports/2008/rwjf22441.